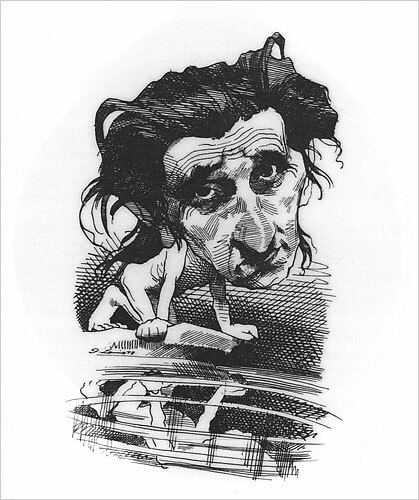 A self-portrait of the artist and caricaturist David Levine. Mr. Levine’s drawings never seemed whimsical, like those of Al Hirschfeld. They didn’t celebrate neurotic self-consciousness, like Jules Feiffer’s. He wasn’t attracted to the macabre, the way Edward Gorey was. His work didn’t possess the arch social consciousness of Edward Sorel’s. Nor was he interested, as Roz Chast is, in the humorous absurdity of quotidian modern life. But in both style and mood, Mr. Levine was as distinct an artist and commentator as any of his well-known contemporaries. His work was not only witty but serious, not only biting but deeply informed, and artful in a painterly sense as well as a literate one; he was, in fact, beyond his pen and ink drawings, an accomplished painter. Those qualities led many to suggest that he was the heir of the 19th-century masters of the illustration, Honoré Daumier and Thomas Nast. 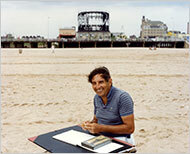 David Levine on the beach at Coney Island, around 1974.